When most of China is welcoming autumn in October, Sanya, a city located in the southernmost tip off of the Chinese Mainland, is witnessing a golden period of tourism for the year. During this time, the weather in the coastal city is not as scorching hot as in the summer and the seawater is not as chilly as in the winter. This city, known as "a place that exports sunshine and air to other parts of the world," is enjoying the best season of the year. It should also be mentioned that in addition to the sunshine, the sandy beaches, and the sea, delicious food is something that cannot be indispensible during travel; and especially during this golden season endowed with an abundance of lobsters and crabs. Sanya is adjacent to the world renowned Beibu Bay Fishery and Nanhai Fishery, which are the only uncontaminated "pure land" fisheries among all offshore Chinese fisheries. Moreover, there are all kinds of seafood including shrimp, lobster, crab, fish, and oyster cooked by various methods, such as boiling, quick-frying, pepper-salt frying, and steaming. Therefore, you have got to taste the seafood once you come to Sanya! Seafood is served in various places. You can enjoy seafood in lanes and alleys, on bayside beaches, hotels, or snack booths. The flavors and prices may vary according to the differences in ambience and cooking methods. The ambience may be luxurious and elegant, or may be casual with local characteristics. The only rule is that you should indulge yourself in savoring the food wherever you are. Enjoying freshly caught fish, shrimp, etc. right on the fishing boat is popular. The most famous for this service in Sanya is the Hongsha Fishing Raft. Here, all the fish and shrimp have never left the seawater and are merely encaged with wooden planks and fishing nets. Customers can choose the fish and shrimp that are fresh and alive in the seawater for consumption. The fishing rafts provide dozens of seafood choices and have very good value for the money. The fishing rafts are the residences as well as the places for conducting business for the local fishermen and proprietors. It is best to have your supper there. You can enjoy the seafood with the sea wind and the setting sun as if you have immersed yourself into the life of the fishing families. Address: northeast of Dadonghai, 30 min drive from the downtown area; accessible by Bus No. 17, approximately RMB 35 yuan by taxi. Many fishing boats are docked by the Hongsha Dock. You can take a fishing boat for free to the fisherman’s own fishery raft and enjoy the seafood buffet. Sanya Fat Lady Seafood Restaurant has become popular despite the fact that it never advertises itself or offers any discounts. Anyone who has once been there knows that the seafood there features good portion size, looks good, and authentic taste. In the seafood restaurants of Sanya, since the fish and shrimp are to be processed right after being purchased, many booth owners may play tricks with the quantity and even secretly replace fresh seafood with dead fish and shrimps to make illegal profits. Such actions frequently lead to conflicts between the sellers and customers. However, Sanya Fat Lady Seafood Restaurant is an exception with not a single case of complaint from customers during its 23 years of operation and was designated by the Sanya Administration of Industry and Commerce as a flagship restaurant in Sanya for seafood. Of course, customers’ word of mouth is the most important factor for the restaurant’s success. Address: Shengli Road, Sanya (diagonally across from the Honggang Farmers’ Market), accessible by Buses No. 4 and No. 11. 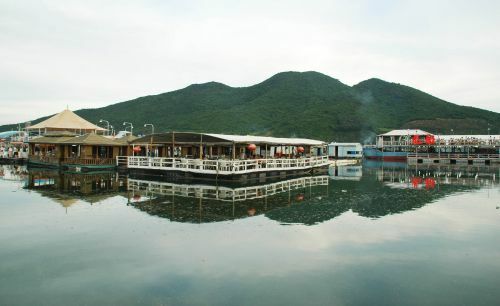 Yelin Seafood Town is renowned for its "petty bourgeoisie" style and serves dishes in an atmosphere that is more exquisite and elegant than that of the fishing rafts and snack shops. Apart from seafood, freshly extracted coconut juice and coconut rice in Yelin Seafood Town are also delicious. Blue swimmer crab congee is also very popular among customers. Special dance shows are presented when dishes are served in the Seafood Town, and customers can appreciate songs and dances with ethnic characteristics of Hainan as well as the delicious seafood. Address: it is located in the Dadonghai Tourist Area with convenient transportation ; accessible by Buses No. 2, 4, and 15, or by taxi for RMB 8-15 yuan from within the downtown area. 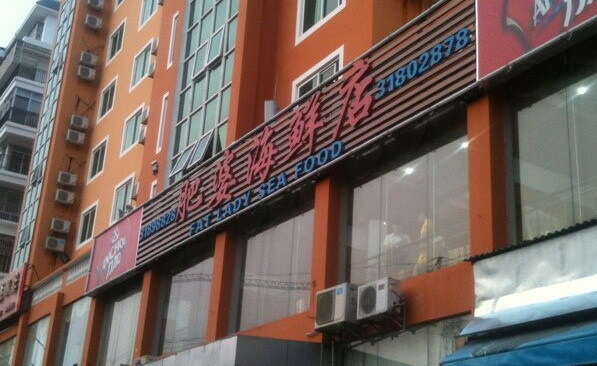 There are seafood restaurants everywhere in Sanya with prices ranging from cheap to expensive. 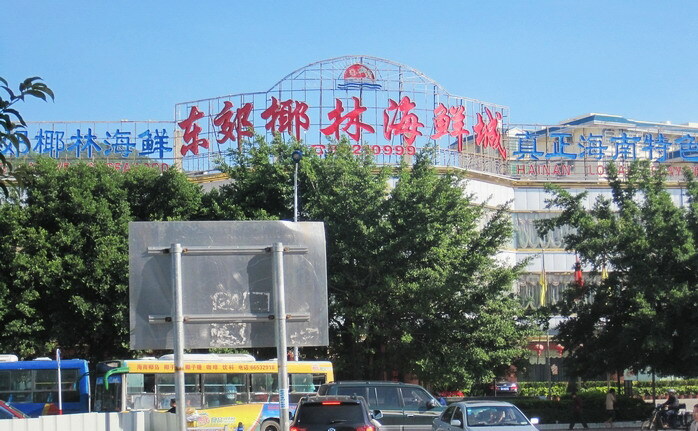 The First Market and Youyi Road Seafood Plaza are crowded with seafood restaurants favored by the locals. Compared with Chunyuan Seafood Plaza which is widely known to tourists, these restaurants serve seafood at lower prices with more authentic taste. It is always a good idea to choose a restaurant with more customers; you may ask the owner to lead you to buy fresh fish from another store and you only have to pay the owner RMB 5-8 per 500g (or per fish, shrimp, etc.) as the price for preparing the seafood. Be careful when selecting fresh fish by yourself: remember to ask the seller to pour out all the water in the plastic bag before weighing, and it is best to bring with you a small hand scale; carefully check the fish to prevent the seller from mixing cheaper types of fish into your purchase. A moderate amount of wine or rice vinegar can be drunk with seafood; however, beer and coconut juice should be avoided because they easily lead to gout and other allergic reactions. The booth owner may offer a variety of cooking methods; however, thinly sliced then boiling is the most original and authentic way of cooking. It is very much like hotpot where only ginger slices, garlic sprouts and others are added to the pot for seasoning, the food is taken out soon after it is boiled in the pot, and is dipped in mustard, soy sauce and other sauces: paying attention to the original taste and flavor of the food.